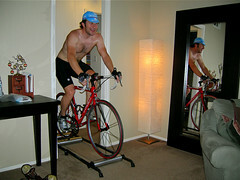 That time of year again, when cyclists ride inside. I’m terrible at trainer discipline and will attempt to ride in most weather, but in some climates a cyclist has no choice. What do you do to stay in shape? Trainer, rollers or maybe some brisk calisthenics and medicine balls? Uploaded by Joel Price | more from the Bike Hugger Photostream.